The Laura and Michael Brader-Araje Community Outreach Gallery is a separate gallery space on the opposite end of our new home at University Place. This additional space, across from the Verizon store, allows us to have a space to host a number of arts organizations, other non-profits and student-run organizations in order to give local organizations a space to show their work. Since acquiring the space in February 2018, we have hosted the PTA Reflections Art Show, the Karen Youth Art Group, the Youth Community Project, the Orange County Artists Guild Spring Art Show and the Triangle Visual Artists Pop-Up Show. This Fall the community gallery will host the FRANK in Focus: Beyond the Classroom photography exhibit in October and two exhibits from the Orange County Artists Guild (OCAG); including the preview show exhibit to their studio tour followed by a holiday show. In honor of International Women’s Day, Frank Community Gallery of Chapel Hill is hosting Women Speak, a celebration of women giving voice to the feminine experience through portraits, poetry, and prose. The three-day event will include a display of works by local artist Nancy L. Smith and written works from women beginning Friday, March 8 through Sunday, March 10. The event will include an artist reception on Friday night and a poetry reading on Sunday. More than 15 special guests will read their responses to Smith’s work. During the past year, Smith has invited women from all over the world to respond to the art works that will be on display. Once a month for six months, Smith released four or five images of her work and invited written responses of 300 words or less. During this period, Smith received over 300 submissions from 100 women living in nine different countries. From these, Smith and a panel of judges selected 30 winners. Many of the authors will read their works at the March 10 event. One of Smith’s favorite entries is by NC writer Aleta Payne inspired by Silent Reflection. You mistake my rage for quiet contemplation. As with so many of my sisters, my pain is an emotional chameleon, camouflaged for my own well-being lest I be labeled undisciplined, difficult, unprofessional, or hostile. God forbid my honesty makes you at all uncomfortable. The politics of respectability leave no room for such things. 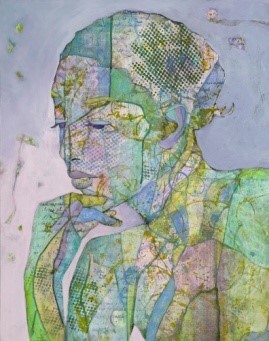 To learn more about Nancy Smith and the beautiful work she does, please visit: www.nancysmithfineart.com. Smith is an award winning water-media and collage artist who has displayed her works frequently in the southeast. Images of her artworks have appeared in numerous books and journals including River; When Women Waken-Being; When Women Waken-War; Genetics in Medicine; and NC Literary Review. FRANK is proud to present “Hero Books” created by Durham Academy 6th grade students! The Book Arts at Durham Academy is a residency led by FRANK artist, Peg Gignoux. Peg works with the students to create creative and beautiful books honoring the heroes in student’s lives. Every year Peg collaborates with FRANK in order to be a destination for these books to be exhibited in an exciting showcase. Please stop by the gallery to see all the incredibly inspiring books made by the students and meet FRANK artist and teacher Peg Gignoux. The books will be on view Saturday, March 23 at the Frank Gallery 2-5 pm. Please join us in our community gallery for a joint show featuring the work of FRANK’s Karen Youth Art Group and the work from the UNC students of Professor Gesche Würfel’s advanced photography class. The Karen Youth Art Group has been led by FRANK artist Nerys Levy for the last 6 years Nerys, along with other FRANK artists, board members, and volunteers, has met with the students every Sunday morning teaching the young students different art techniques, taking them on educational field trips, and educating them on the gallery and local museums. Inspiring the students to experiment with various different mediums and honing in on their particular interests Nerys has been able to help the students in their artistic endeavours as well as in their personal lives. Come and see the work of these young artists in the month of April and learn more about the program.FRANK Gallery’s Karen Youth Art Group was established over six years ago in response to the realization of the inherent artistic talent in our local Karen community’s youths. Also on display for the month of April is the work of students from UNC Professor Gesche Würfel’s ARTS 515 Advanced Photography class. This photographic exhibition also in the FRANK Community Gallery will be a beautiful showcase highlighting the photography of Gesche’s talented students. Students from ARTS 515 have been working on semester-long projects all encompassing a theme of their choosing and FRANK is thrilled to be able to have the work of the students in the community gallery. Most of our students were born in Karen refugee camps in Thailand to where the Karens fled from their homes after being driven out by the Burmese military. Our students and their families came to the USA as refugees and now constitute a significant part of our local community where they work as housekeepers for UNC and other local institutions. In addition, many of our students’ families also farm at Transplanting Traditions Community Farm. Our students have benefited from and contributed immensely to the FRANK Community. Three years ago FRANK published a two year long art/ literary project by the students on Transplanting Traditions Community Farm as a bilingual illustrated book. Some of our older students are now in further education and are progressing to higher education in places such as Guilford College and UNC Greensboro. Our Junior Art Group members are all in local high schools. This exhibition showcases the work of students such as Lah Htoo Boh who is hoping to study Fine Arts at UNC Greensboro in the fall and our juniors who meet weekly at FRANK where they paint and draw in response to the art filled surroundings of their Gallery classroom. Some of their paintings are also a response to our many museum outings but particularly to the Georgia O’Keefe show at NCMA in the fall of 2018. Stay tuned as more information about the OCAG Spring Show will be updated shortly! **UPDATE: Congratulations to the following state-wide winners! The North Carolina PTA (NCPTA) is the state’s oldest and largest volunteer organization advocating for the education, health, safety and success of all children and youth while building strong families and communities. PTAs across North Carolina impact more than 685,000 children and their families. Sponsored by the NCPTA, the Reflections Art Program encourages creativity and lifelong learning while offering recognition for artistic endeavors. The PTA Reflections Program is designed to enhance quality arts education for students in preschool through grade 12. Every year, the Reflections Program challenges students to a particular theme and puts out a call to students from PK- 12th grade to submit art based on the chosen theme. Submissions can range from the visual arts, dance, film, literature, music, and photography. Participants of the 2018-2019 theme of “Heroes Around Me” will be displayed in our Community Gallery for the month of February with an opening reception on February 8th from 6-8pm. Please join us in our community gallery for the OCAG Holiday Show, “Deck the Walls.” The artists of OCAG are showcasing work for most of their artists at a range of sizes and price levels. Come see all the work during their opening hours and then swing down to visit the FRANK main gallery. Hope to see you soon! Did you know that Orange County is the most heavily dense county of artists in North Carolina? The Studio Tour is the primary focus of the guild, it is held annually, the first two weekends in November, and gives the public a chance to view the studios of artists of the guild, free of charge. There are 71 artists that are participating this year! Also, every year FRANK gallery participates in showcasing a preview of the work of the members of the Orange County Artists Guild. This year, we are lucky to have an expansive location to display the preview show right here in University Place! Please join us in our community gallery as the OCAG members showcase a preview of what is to be expected from their open studio tours. Pick out your favorite artists and map out your route around town to visit their studios and learn more about their work. Click here to view the brochure and map of the studios. Please join us for FRANK in Focus photography exhibition in association with the CLICK! Festival. FRANK's Community Outreach Gallery presents FRANK in Focus; Beyond the Classroom: An exhibition showcasing the work of photographic artists, educators, and life-long learners. The show will run from October 3rd-October 20th with several events hosted in the community gallery space throughout the time that it will be exhibited. The gallery will be open from Wednesday-Friday 2-6pm and Saturday 2-7pm. FRANK Artists/Former Educators Peter Filene, (UNC) Bill McAllister, (Art Institute of Atlanta), Barbara Tyroler, (University of Maryland), and Sam Wang (Clemson). "Singular Visions: What's Old is New Again": Artist/Educator Diana Bloomfield 19th century photographic printing processes, and tow former students, Hane Wiley and Debbie Warren. From Concept to Gallery: Artists and Duke's Center for Documentary Photography educators, Durward Rogers, and Barbara Tyroler with workshop participants Blythe Devlin, Cliff Haac, Paul Jadot, Chris Krueger, Amy Lark, Anthony LaVopa, Kim Moore, Terry Nicotra, Richard Schramm, Elisabeth Tyroler and Kenneth Zeitler. CLICK! Bus Tour of FRANK in Focus Exhibit and first day of the exhibit. The CLICK! Festival Bus Tour will be departing from the 21c Hotel in Durham around 1pm and should be arriving to tour the community gallery around 2pm. The gallery will be open from 2-6pm. Parent Night Out at KIDZU Gallery Tour. On October 12th from 6:30-7:30 FRANK is partnering up with Kidzu for their monthly second Friday event, "Parents Night Out," (where childcare is available as part of signing up for the program). After drop off walk on down to FRANK's community gallery for a special tour of the FRANK in Focus photography exhibit, hosted by Kidzu Creative Director and FRANK artists. Also, visit the main gallery space to hear Nerys Levy talk about her October/November exhibit right after the tour of the community gallery. Reception and Meet the Artists! Also, in the main gallery (closer to Silverspot) FRANK will be hosting an artist talk, showcasing the innovative photography of Bill McAllister. 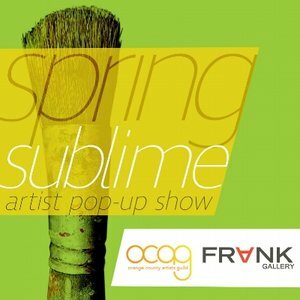 Mingle with the FRANK crowd and then head on over to the OCAG opening! Light refreshments will be provided.